Sometimes hair can get dull-looking. 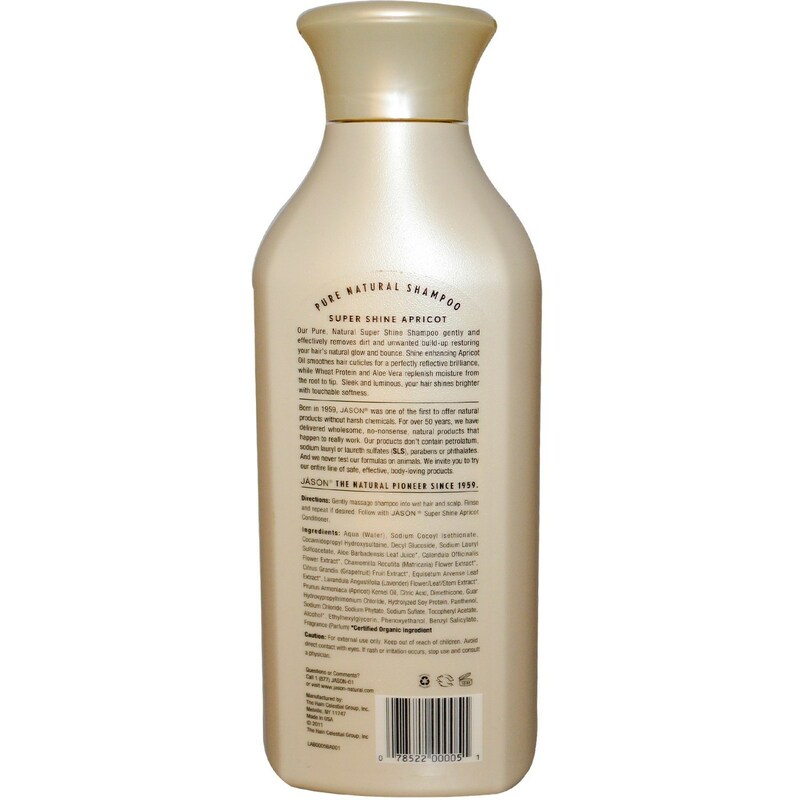 Fix that issue with Super Shine Apricot Pure Natural Shampoo from Jason. This product contains all-natural Apricot and Jojoba Seed Oils which work to restore shine to hair and keep it looking healthy. Super Shine Apricot Pure Natural Shampoo from Jason gently cleans your hair with mild ingredients so your hair looks refreshed, nourished and luxurious. Aloe Vera aids in moisturizing hair and combatting dryness. 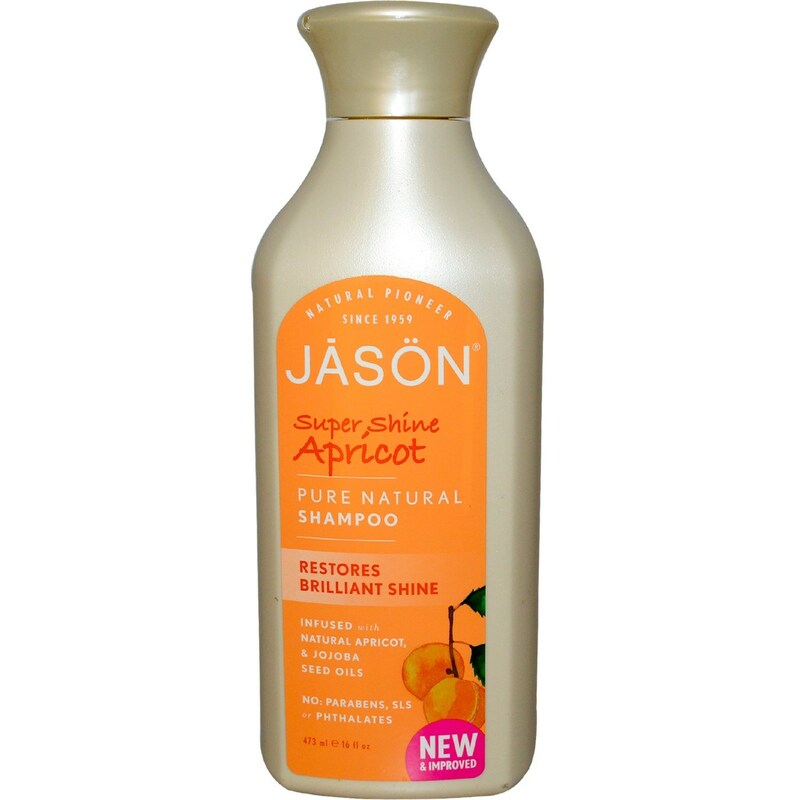 Your dull hair will be back to looking brilliantly lustrous when you cleanse with Super Shine Apricot Pure Natural Shampoo from Jason. Get it today at eVitamins for a low price! Advertências: For external use only. Avoid direct contact with eyes. If rash or irritation occurs, stop use and consult a physician. Notas: Free of parabens, SLS and phthalates. Disclaimer: These statements have not been evaluated by the FDA. These products are not intended to diagnose, treat, cure, or prevent any disease. Ingredients: Aqua (Water), Sodium Cocoyl Isethionate, Cocamidopropyl Hydroxysultaine, Decyl Glucoside, Sodium Lauryl Sulfoacetate, Aloe barbadensis Leaf Juice, Calendula officinalis Flower Extract, Chamomilla recutita (Matricaria) Flower Extract, Citrus grandis (Grapefruit) Fruit Extract, Equisetum arvense Leaf Extract, Lavandula angustifolia (Lavender) Flower/Leaf/Stem Extract, Prunus armeniaca (Apricot) Kernel Oil, Citric Acid, Dimethicone, Guar Hydroxypropyltrimonium Chloride, Hydrolyzed Soy Protein, Panthenol, Sodium Chloride, Sodium Phytate, Sodium Sulfate, Tocopheryl Acetate, Alcohol(1), Ehtylhexylglycerin, Phenoxyethanol, Benzyl Salicylate and Fragrance (Parfum). Directions: Gently massage shampoo into wet hair and scalp. Rinse and repeat, if desired.